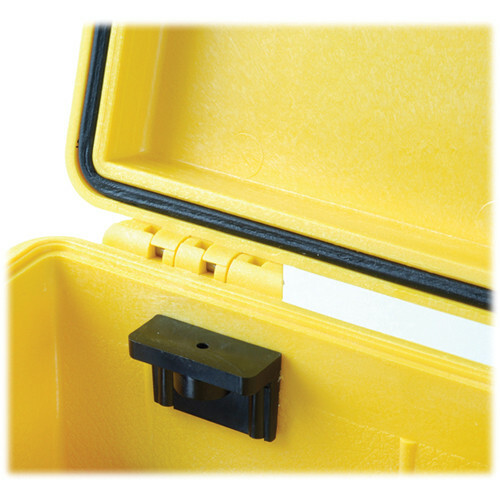 The Pelican 1507 Peli-Quick Mounts are a set of four mounts used for special equipment mounting inside the case. They will fit all Pelican cases. Mounts used for inside of case. 1507 Peli-Quick Mounts is rated 3.7 out of 5 by 3. Rated 1 out of 5 by Christian from Pretty useless I ordered these parts because i wanted to stick with original parts to mount a Panel in a PELI. However they dont even come with glue for attachment, neither a proper tapped insert to screw in. If you have any chance to 3D print something similar, do not buy this! Also Customer Service does not even answer my complaint.. Rated 5 out of 5 by lewi from Came just as expected Great product great price. Rated 5 out of 5 by Marco C from Worked fine Used it to integrate field testing data acquisition equipment into pelican case, worked just fine. what are the dimensions of the product? (length width and height)? The Pelican 1507 Peli-Quick Mounts measure 1.49 long by 0.61 deep by 1 high. What is the mounting hole diameter on these, and are the holes threaded? It is not threaded and is about 3 mm wide. So is this like adhesive to case interior and you screw/anchor your dividers, etc, into it? You can find the very special adhesive noted in the Pelican site using Pelican mount adhesive as your search. The simple answer is that almost nothing will stay adhered to the polypropylene case material. the alternative is mechanical, drill and screw.